This information is provided for informational and educational use only. This information is not to be construed as legal or medical advice on any subject matter. Do not inhale the nitrous oxide found in whippits. It may cause serious and irreversible damage to your health, including death. Creamright and Waterline Marketing Co. are not liable in any way for injuries or deaths caused to anyone, regardless of age, by the misuse of the products found on this website. Whippits is a slang term for nitrous oxide whipped cream chargers. More specifically, whippits usually refers to whipped cream chargers. Although there is a brand of whipped cream charger actually named Whip-It , the word "whippits" can mean any brand of nitrous oxide charger - iSi, Purewhip, EZ-Whip, etc. Whippits (whipped cream chargers) are small stainless steel canisters that are filled with 8 grams of food-grade nitrous oxide. Each 8 gram whippit is approximately 3/4" x 2.5" and weighs approximately 25 grams. Whippits should not be confused with CO2 soda chargers, which are commonly used for making soda water and for use with pellet guns. Nitrous oxide has been used since the 1800s as an anesthetic and pain killer. Nitrous oxide is still one of the safest, most effective anesthetics available to modern dentists. As an anesthetic, nitrous oxide is usually administered to the patient via a specialized machine which mixes the nitrous oxide with oxygen (30% N2O, 70% O2) and allows the physician to precisely control the flow of gas. The exact manner in which nitrous oxide affects the brain is still unknown. However, nitrous oxide is known to interact with a broad range of neurotransmitters. Nitrous oxide's painkilling properties are interesting in that they mimics the characteristics of more powerful opiates, without many of its side effects, making it a highly effective treatment option for localized surgeries. Whippits, like other drugs, pose the potential for abuse by humans. While the dependence from nitrous oxide is not as severe as that of more powerful drugs, such as cocaine and heroin, chronic abusers of nitrous oxide will often develop strong emotional dependencies to the drug which can be highly destructive to the abuser and those around him. The inhalation of nitrous oxide is also known to produce a number of harmful side effects in humans. Nitrous oxide is known to suppress the body's ability to absorb vitamin B12, which can be particularly harmful for people with B12 deficiencies. A far more common, yet overlooked side effect of whippit useuse is injury caused by the release of the super cold gas from the whipped cream charger. The nitrous oxide found in whippits is extremely cold and it is capable of burning users' face, nose, lips, tongue, and throat. Death from nitrous oxide is rare, but is most common when a person attempts to inhale the nitrous oxide out of a bag, ballon, or some other container that has been placed over their head or face and accidentally asphyxiates themselves. 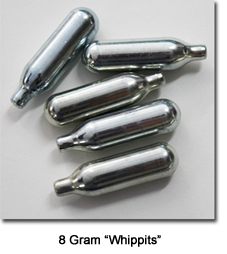 The possession of whippits, or more specifically, the nitrous oxide found in whippits, is legal in the United States. However, like all products which can potentially effect food safety, the regulation of nitrous oxide is under the purview of the U.S. Food and Drug Administration. Additionally, the possession of crackers or any other devices which serve no purpose but to open a whipped cream charger is regulated and outlawed in a number of states. The sale of such devices is also outlawed in many of those states, and Creamright will not knowingly sell to anyone who uses our products for these purposes. Many states have also passed laws regulating the possession and sale of whipped cream chargers. In most states, it is illegal for minors to purchase or possess nitrous oxide. Nearly every state has also passed laws making it a crime to inhale or consume nitrous oxide, or possess nitrous oxide with the intent to consume it. Furthermore, the FDA regulates the labeling and distribution of nitrous chargers, making it a crime to sell nitrous oxide for the purpose of human consumption.